Fire Chief Richard C. Hutchinson Jr.
Chief Hutchinson started his firefighting career on July 22, 1980 when at the age of 16 he was hired as a Reserve Fire Firefighter by the Poway Fire Department. On August 27, 1982 Rick was hired as a Seasonal Firefighter by the California Department of Forestry / CAL FIRE in the San Diego Unit. Over the next thirty-two years Rick Worked in the Tulare, Santa Clara and San Benito – Monterey CAL FIRE units. He promoted through the ranks working in both state and local government operations, Air Attack Base, Emergency Command Center and Training programs. Chief Hutchinson was appointed to the position of Assistant Chief on August 14, 2000 overseeing business services functions, field operations, Conservation Camp and Logistics programs. On January 1, 2010, Chief Hutchinson was appointed as the San Benito-Monterey Unit Chief where he served as Unit Chief for the unit and Fire Chief for Aromas Tri-County Fire Protection District (FPD), Carmel Highlands FPD, Cypress FPD, CSU Monterey Bay Fire and Emergency Services, Mission – Soledad FPD, Pebble Beach Community Services District Fire Department, City of Soledad Fire Department and South Monterey County FPD. June 22, 2014 Rick retired from firefighting - however - on October 1, 2017, Rick was appointed as Interim Fire Chief for the North County Fire Protection District and is very happy and honored to have the opportunity to lead our District into the future. Rick lives in Gonzales with his wife Pam. They have two daughters Stephani and Amanda and four grand children Emily, Jake, Sarah and Devin. Division Chief/Fire Marshal Joel Mendoza is responsible for the Fire Prevention Division of the North County Fire District; which encompasses the communities of Pajaro, Las Lomas, Royal Oaks, Moss Landing, Prunedale, and Castroville. 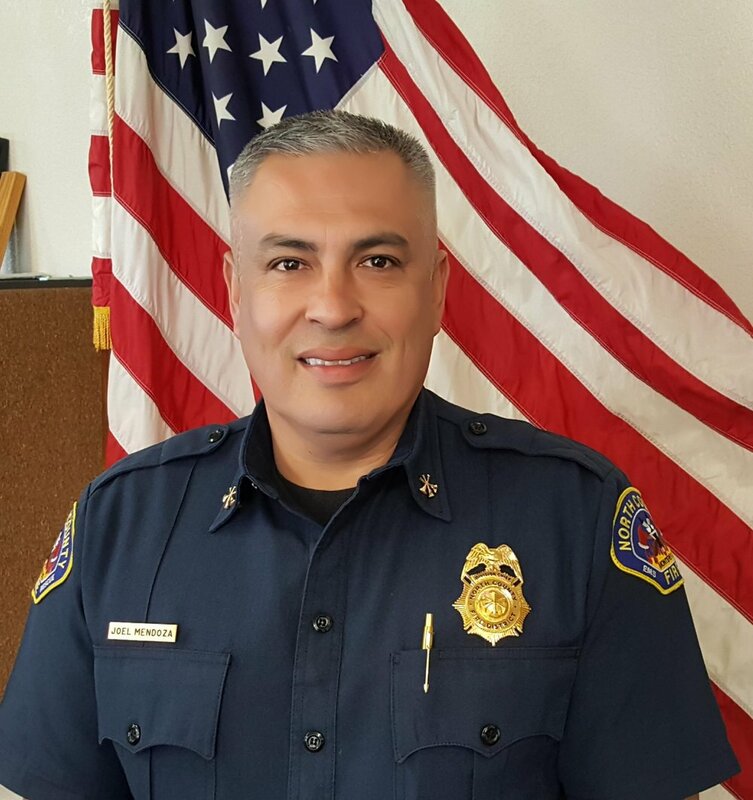 Chief Mendoza leads an office that provides oversight and implementation of all regulatory inspection and planning programs, public education and special events for the fire district and provides emergency response to major incidents, including large fires, Mass Casualty incidents and Haz-Mat related incidents. Chief Mendoza entered the fire service in 1995, when he joined the Watsonville Fire Department as a paid call firefighter. In 1998 Chief Mendoza was hired by the North County Fire District as a paid call firefighter. He promoted to full time firefighter in 2001 and subsequently Fire Lieutenant in 2007 and Captain in 2009. He served as the districts Weed Abatement Officer from 2007 to 2017. 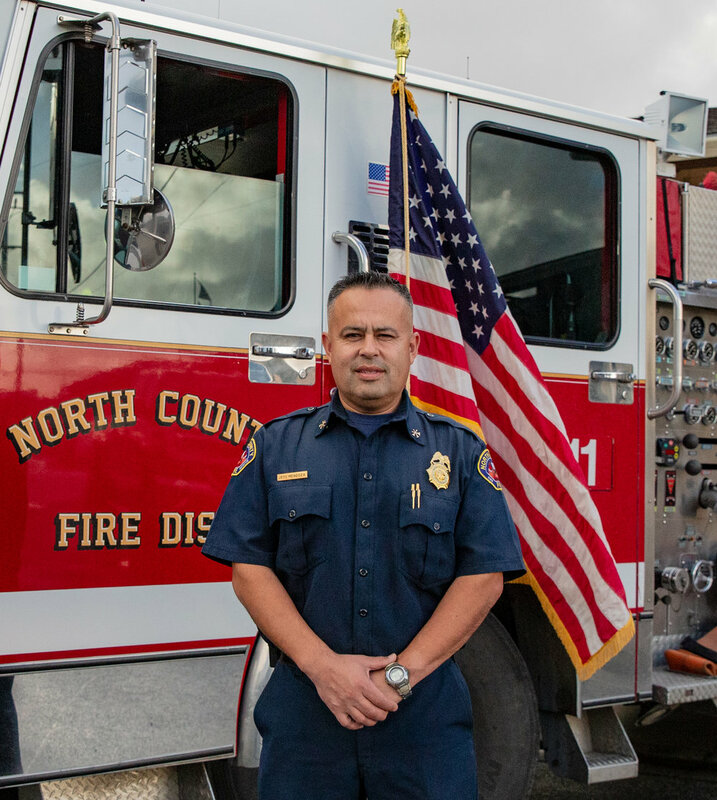 Chief Mendoza holds an associate’s degree in Fire Science and he is also certified as a Fire Officer and Chief Officer by the State Board of Fire Services. Carolina Bravo joined the North County Fire Protection District in April of 2013 and is responsible for the district’s administrative services including accounting/payroll, human resources, employee benefits, and serves as the clerk to the board. Bravo holds a B.S. in Business Administration from San Jose State University and a M.S. in Human Resource Management from Golden Gate University. Casey Hendricks joined the North County Fire Protection District in October of 2017. She holds an A.S. in Administration of Justice and has been working in Finance for 20 years. She enjoys spending time with her son and coaching his baseball team.